Live More, Bank Less. DBS. DBS’s Xing and Jaan are here again! Live more and bank less with these cute stickers! 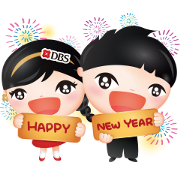 Friend DBS Bank (Taiwan) Ltd.’s official account to get the set for free.